Born in 1954 in the Semipalatinsk region (now East Kazakhstan). In 1995 she graduated from Perm State University with a degree in Surveying, prospecting and exploration for mineral deposits. 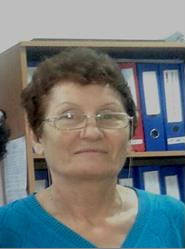 From 1977 to 2010 she worked consecutively in the “Party of Geochemical Research at the TsKGU” as a geological technician, as well as a “Search and Survey Expedition” as a geologist, and Elrovo JSC as a local geologist. Since 2010, he has been working at KarSTU at the Geology Department of Mineral Prospecting. Co-author of 2 scientific articles, 15 educational and methodical works, lectures and conducts laboratory and practical classes in the following disciplines: “General and Historical Geology”, “Geomorphology and Geology”, “Petrography”, “Geology of Oil and Gas”, “Mine and mining geology ”,“ Geochemistry ”,“ Geological and economic evaluation of mineral deposits ”,“ Regional geology and geotectonics ”,“ Geomorphology and quaternary geology ”,“ Metallogeny and ore formations ”,“ Simulation of mineral deposits ”,“ Industrial mineral deposits ”, oversees production and pre-diploma practice. The curator of the group GPR-15-4.